As we've reported quite a bit, downtown LA is seeing a formidable resurgence. An equally formidable panel will meet at LA's A+D Museum on Tuesday to debate the phenomenon, looking at the architectural development of Grand Avenue, adaptive reuse in the historic corridor, hip emergence and clean tech in the arts district, and so on. Panelists include architect Michael Maltzan; AN West Coast Editor Sam Lubell; KCRW's Frances Anderton; Ayahlushim Getachew, Senior Vice President at Thomas Properties Group; Bob Hale, Principal at Rios Clementi Hale Studios; and Carol Schatz, President and CEO of Downtown Center Business Improvement District and the Central City Association. The event will also include a signing of Anderton's illuminating new book on Grand Avenue, Grand Illusion. 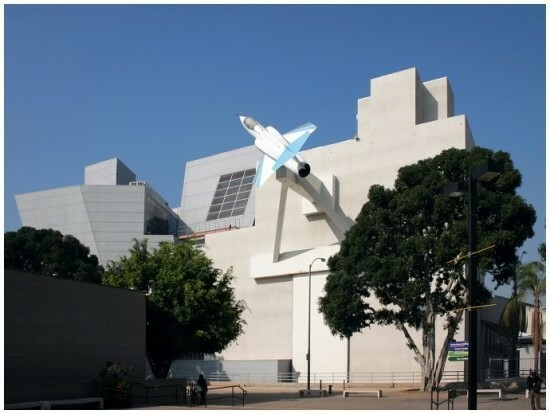 AN found out today that Frank Gehry's Aerospace Hall at the California Science Center (now known as the Air and Space Gallery) in Los Angeles has now been listed on the California Register by the California Office of Historic Preservation. 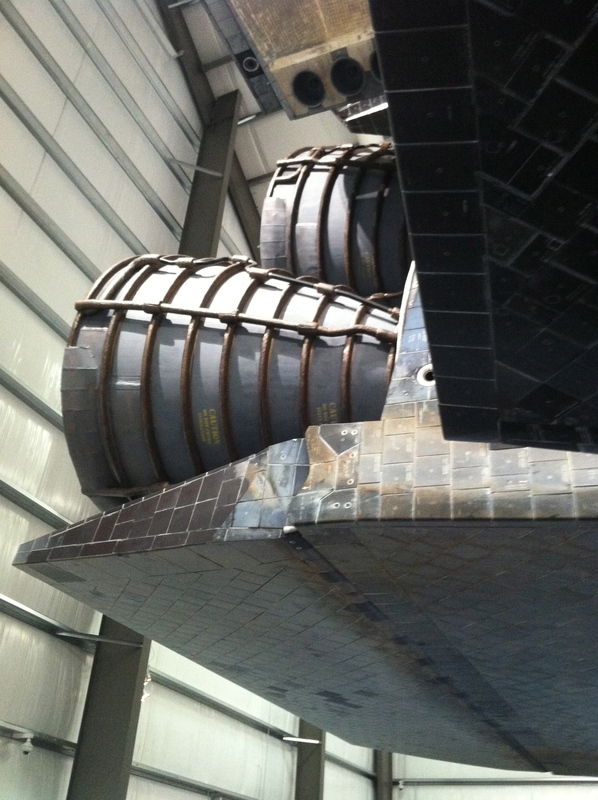 As we've reported, the museum's fate has been in doubt as the Science Center makes plans for a new building to house the Space Shuttle Endeavor, and refuses to comment on what it plans to do with Gehry's building, which was shuttered last year. The listing doesn't guarantee the building's protection, but it could slow down any threats. It may trigger an environmental review if another building were to replace it. 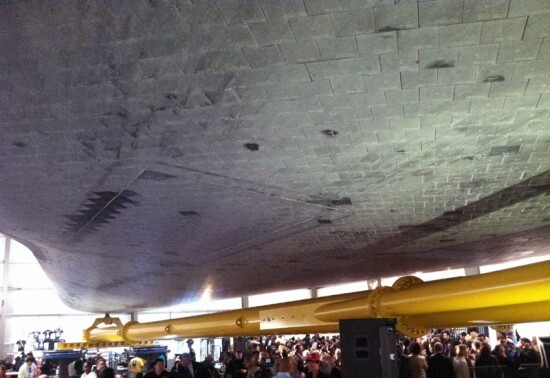 At the very least, the museum would need to review the impact of a demolition or major change. The angular, metal-clad building, built in 1984, was Gehry's first major public building. 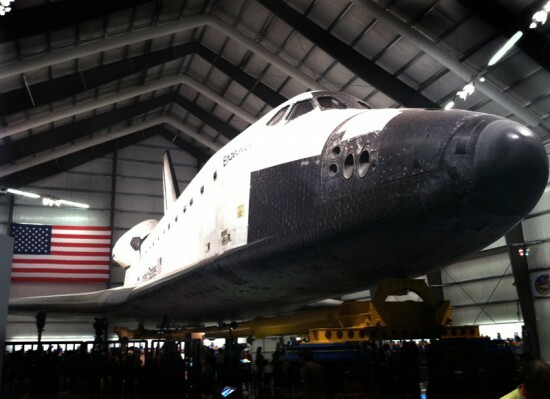 The Best Architecture In LA Isn’t A Building, It’s the Space Shuttle. 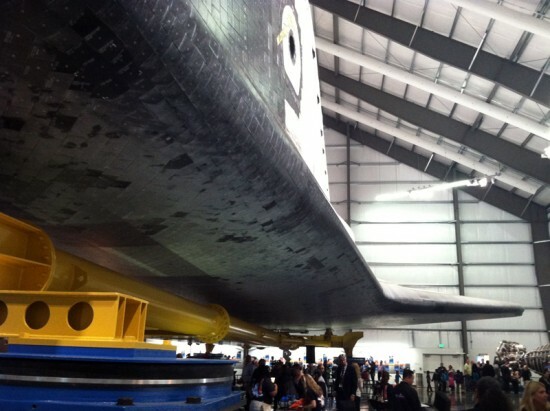 Yesterday, AN got a first hand look at the Space Shuttle Endeavor resting inside its new home, the 18,000 square foot Samuel Oschin Pavilion at LA's California Science Center. The verdict: go see it. No piece of architecture in recent memory has been as breathtaking as the shuttle. There are so many reasons for its grandeur: its Herculean scale, its celebrity, the nostalgia factor, and the fact that it doesn't look real. 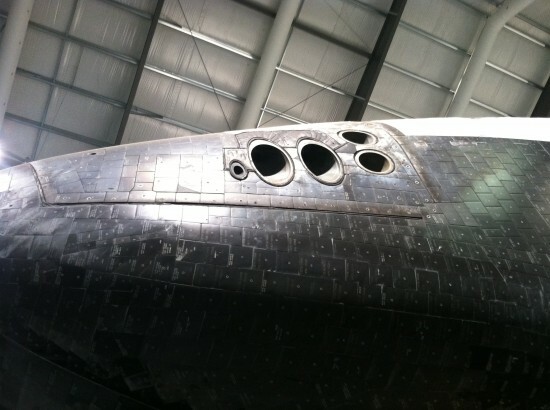 With its mismatched styrafoam-like tiles, space-aged gizmos and ports, and nose resembling a beak it looks like a giant toy. And that gives it a strange, endearing charm. But most of all is the reminder of the ambition that it represents. An ambition that in the world of architecture—with its bottom-line mentality, zoning codes, permits, and timid developers—is so often lost. Experiencing the shuttle is a profound experience that all architecture should strive to emulate. Even with its jumbled pieces and areas that appear to be held together with tape, this is a majestic vehicle. See it now. 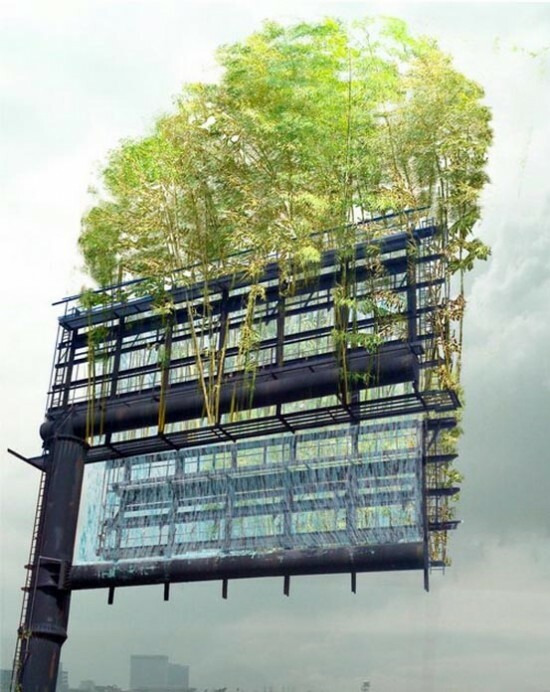 Now this looks like a good idea: a group of architects and engineers called Urban Air are trying to turn a billboard next to LA's 10 Freeway into a suspended bamboo garden. The technique: they remove the signage, install planters and then the bamboo, and then install water misters and sensors to make sure it's properly irrigated. Voila! If it's successful with the first sign the group wants to create similar gardens across the country. The ambitious plan is being crowd-funded through Kickstarter and with 46 days left has raised nearly $6,000 of its $100,000 goal as of this publishing. You can check out their Kickstarter campaign and contribute here. We've finally gotten a reveal of Millenium Hollywood, the two residential and hotel towers planned on either side of the Capitol Records building in Hollywood. The verdict: What Capitol Records Building? New renderings suggest the landmark 1956 Welton Becket-designed structure could basically disappear from view. 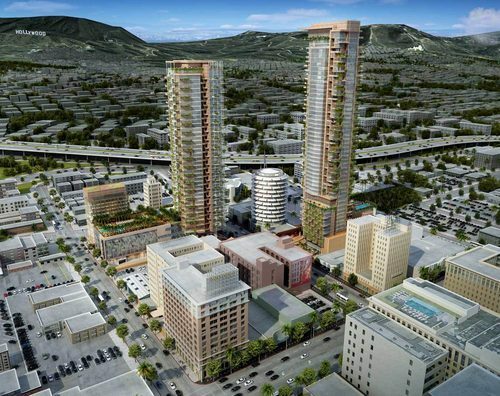 According to the Draft EIR, the Millenium Hollywood designs by Handel Architects and Roschen Van Cleve Architects could measure as tall as 585 feet on the east side of Vine Street and 485 feet on the west side of Vine Street. According to the document the rectilinear, vigorously articulated glass and stone-clad towers could hold 492 residential units and 200 luxury hotel rooms. 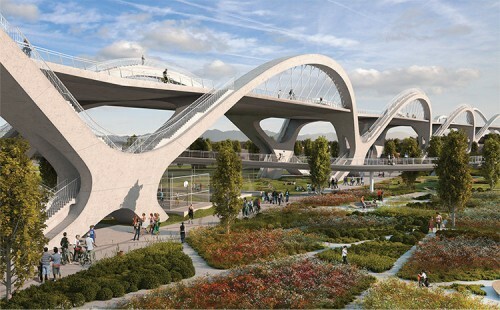 The landscape will be executed by High Line-designer James Corner Field Operations. But plans still remain conceptual: the draft EIR also explores shorter heights and less-intrusive massings, and the project is still far from gaining city approval. Of course Roschen Van Cleve principal Bill Roschen is president of the LA City Planning Commission, so that never hurts. Something tells us preservationists, and hill dwellers worrying about their views, are mobilizing as we speak. Click a thumbnail to launch the slideshow. 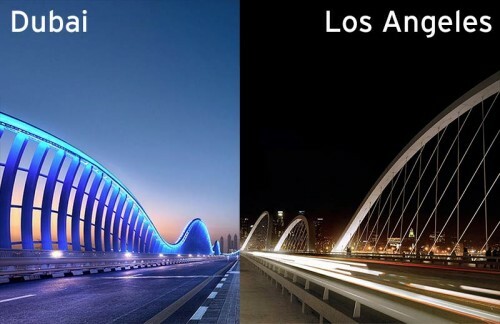 VS The Meydan Bridge in Dubai. 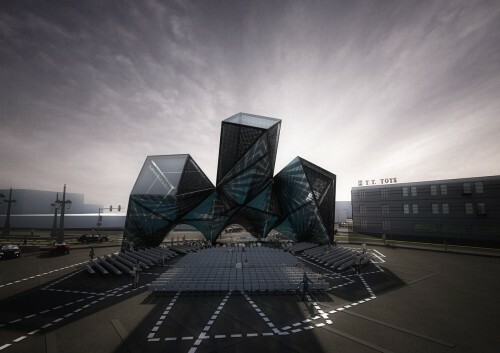 We just got our first look at next year's SCI-Arc graduation pavilion, League of Shadows, by Los Angeles-firm P-A-T-T-E-R-N-S. Whoah. 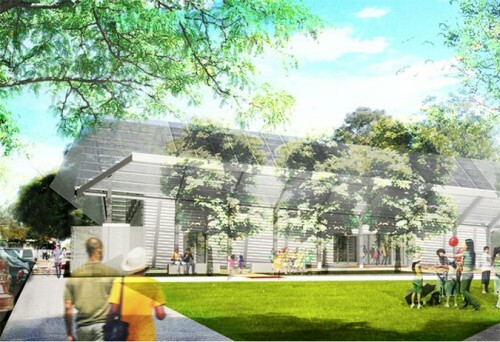 The pavilion, which will seat 1,200 people, will be built in the SCI-Arc parking lot for graduation events in spring 2013. 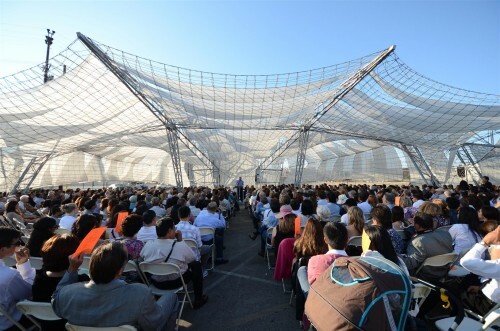 The three-fingered structure will be made up of multi-story, angled frames (ahem) patterned with dark, vaulted, and layered multi-colored fabric strips, with seams like sails. The pavilion's significant height will provide long shadows (hence the project's name) and its location on the south end of the SCI-Arc parking lot will make it a sign for the school. Entries from the four competing architects will be on display in the SCI-Arc Library Gallery from October 19 to December 2. Little, leafy-green patches are sprouting up over Los Angeles as part of the city’s “50 Parks Initiative,” a public-private program designed to revive some of the city’s neediest, most densely populated communities. 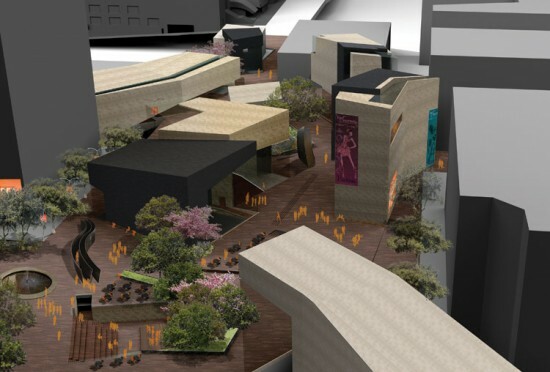 To date, there are actually 53 of these pocket parks planned, with one of the first parks, 49th Street Park in South Los Angeles, opening earlier this month. When completed, the small parks combined will cover a total of 170 acres, and many of the individual parks will be under an acre. Not only are the parks small, but they will be somewhat self-sufficient. 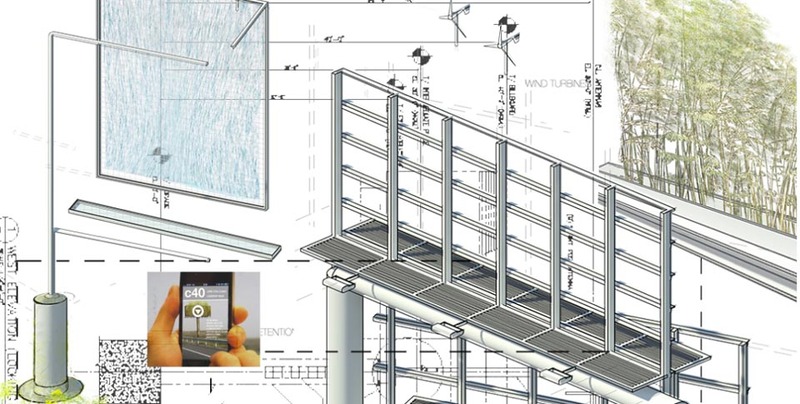 Requiring only four to six months to build, these micro-recreation areas will be decked out with “no mow” grass, drought tolerant plants, smart irrigation, and solar-powered, self-contained waste bins that can hold five times the average amount of trash. And to keep intruders out after hours, automatic time-lock gates and solar motion-activated cameras will be installed. Adding to the good news, these pocket parks tap unused lands. Many will be located on foreclosed properties that cannot be rehabilitated or tucked away on vacant parking lots. Designed to serve people within walking distance of the park, they offer a hyper-local community center. 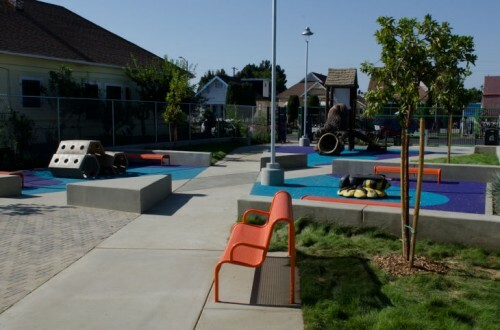 Funding for the parks comes from federal grants such as the Neighborhood Stabilization Program and from over a dozen other sources including local, state, private, nonprofit, and corporate donations. A special nod goes to the Department of Recreation and Parks Board of Commissioners and the Los Angeles Parks Foundation who are the driving forces behind this initiative. Parks and Rec will be overseeing park designs and working with neighborhood residents and organizations. 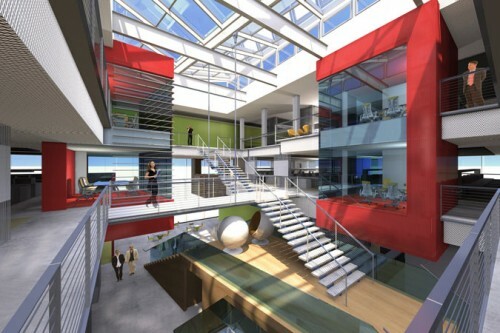 We’re big fans of Gensler’s new downtown LA offices, which open up to a central atrium, keeping employees visually and physically connected. But the firm’s growth has forced it to partially abandon that model, moving extra employees to the decidedly-less-airy upper floors of their building, City National Plaza. Even in the most democratic offices, you can’t escape hierarchy!